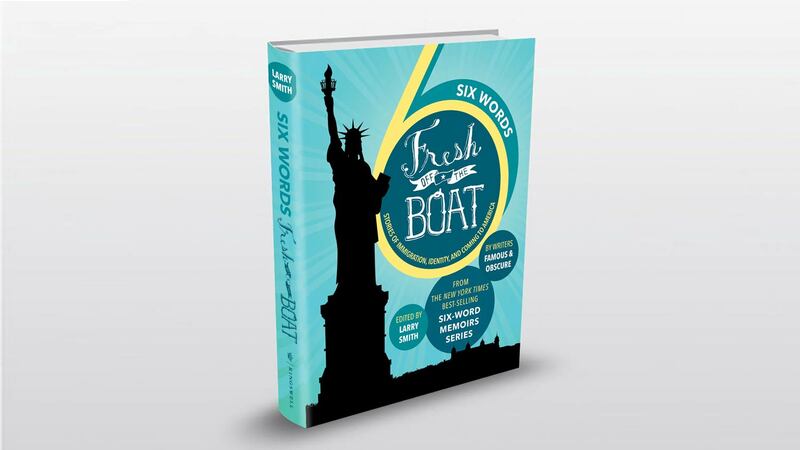 Marrying the acclaimed immigration-themed ABC series Fresh Off the Boat with the New York Times bestselling Six-Word Memoir series by Larry Smith, Kingswell Press is thrilled to publish Six Words Fresh Off the Boat: Stories of Immigration, Identity, and Coming to America. This timely and unique crowd-sourced book of immigration stories — each told in six words — captures hundreds of memoirs on the experience from across America, spanning cultures and generations, to paint a powerful portrait of who we are as a country, and where we came from. Contributors include refugees (“Refugee went from burkas to bachelors,” “Boat person finds freedom in America”); students (“I only speak Spanish on weekends,” “Hoping my school lunch doesn’t ‘smell’”); armed forces personnel (“Salvadoran immigrant raises US Navy diver,” “Retired Marine, looked upon as outsider”); an astronaut (“From farm worker to NASA astronaut”); an Olympian (“Albanian Olympian flees for America: reborn”); and a Teen Jeopardy winner (“Land of opportunity lets me learn”). Plus: Hon. Madeleine Albright, Mario Batali, Billy Collins, Mark Cuban, Junot Díaz, Neil Gaiman, Mayor Eric Garcetti, Diane Guerrero, Dr. Sanjay Gupta, Ron Howard, Eddie Huang, Arianna Huffington, Maz Jobrani, Hasan Minhaj, Amanda Palmer, Randall Park, Gary Shteyngart, M. Night Shyamalan, Gabourey Sidibe, Hudson Yang, Ginger Zee, and many more. Entertainment Weekly: As debates about immigration remain at the center of our political landscape, the creators of ABC’s Fresh Off the Boat have teamed up with Six-Word Memoirs for a collection of short paeans to immigrant parents and America’s open doors. Check out Buzzfeed’s list of some of their favorite micro-tales. Watch Larry on WBGH discuss his latest work, “Six Words Fresh Off The Boat: Stories of Immigration, Identity, and Coming To America.” with Jim Braude. Hint: Larry comes on at minute 17:00.
all with the ultimate goal of sharing first-person accounts, both joyful and harrowing, of coming to America. NBC News and The Hollywood Reporter gave us a little help early in the process.